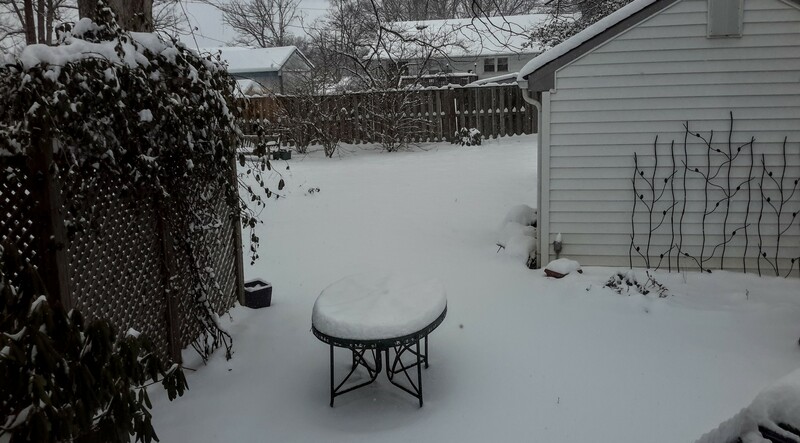 So, it’s Garden Bloggers Bloom Day, but all we have here is a blanket of snow. 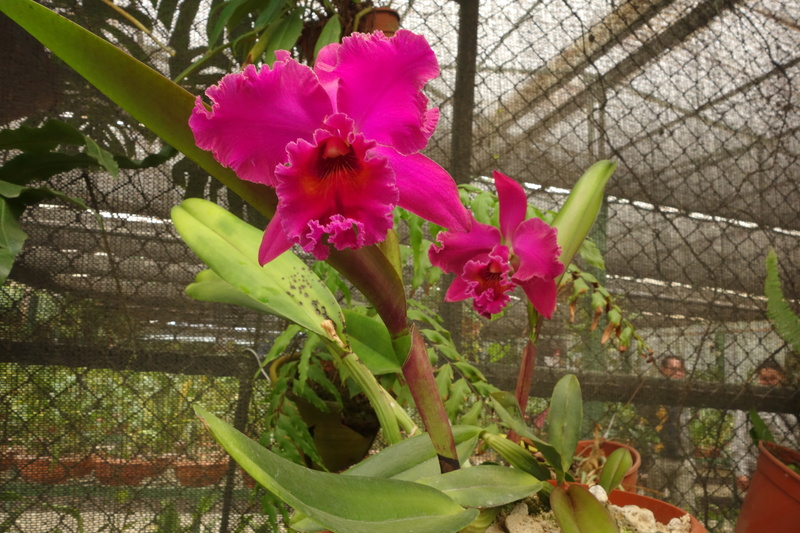 Instead, here is an orchid I saw two days ago at the Lankester Botanical Garden in Costa Rica. 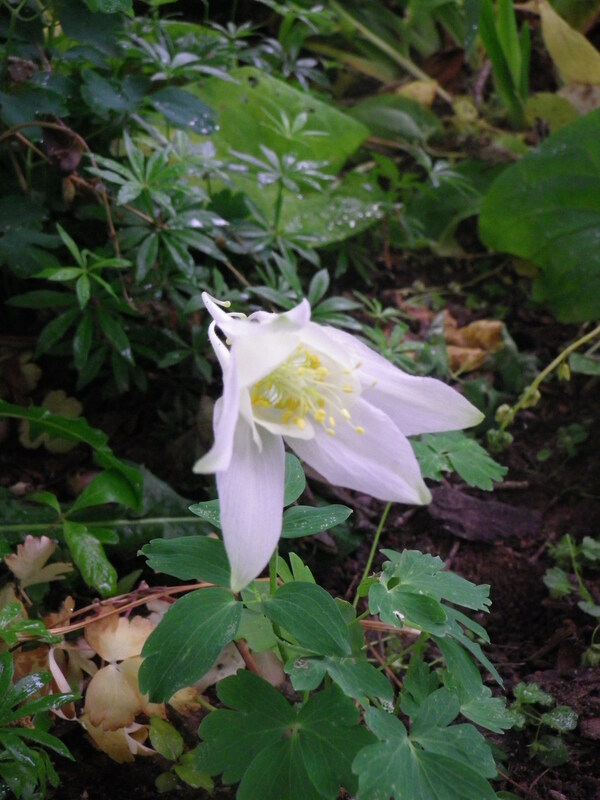 The columbines are beginning to go to seed. Clearly, I sprinkled the seed everywhere last year, since they have now popped up along the walkway and in the erstwhile white garden, where their tall, airy dark violet (and occasionally white) blossoms are just the right scale for the space. Speaking of columbines, Santa Rosa Gardens enticed me with an offer of aquilegia ‘Songbird’ mix free with a hosta order, and I bit. Here’s the lovely white bloom that resulted, somehow bigger yet more delicate than the ones that self-seed everywhere. 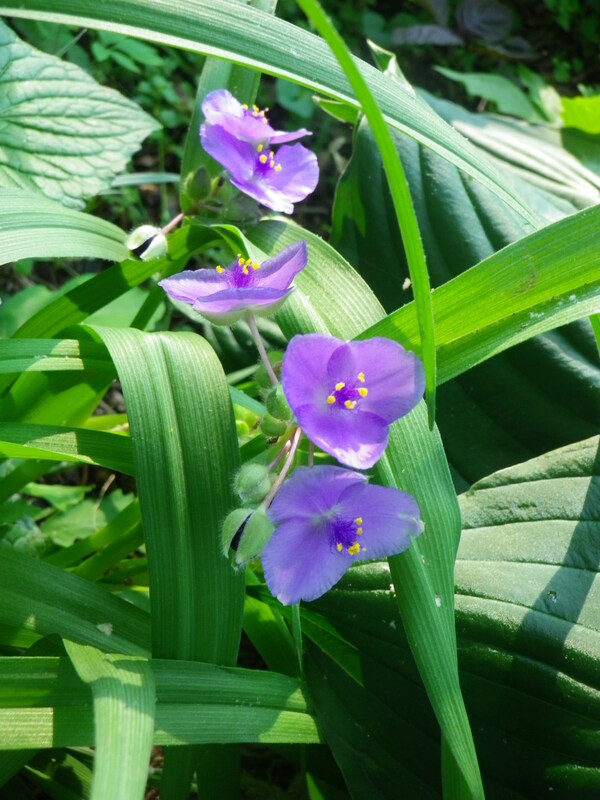 Also in bloom: amsonia, baptisia, sages, peonies. 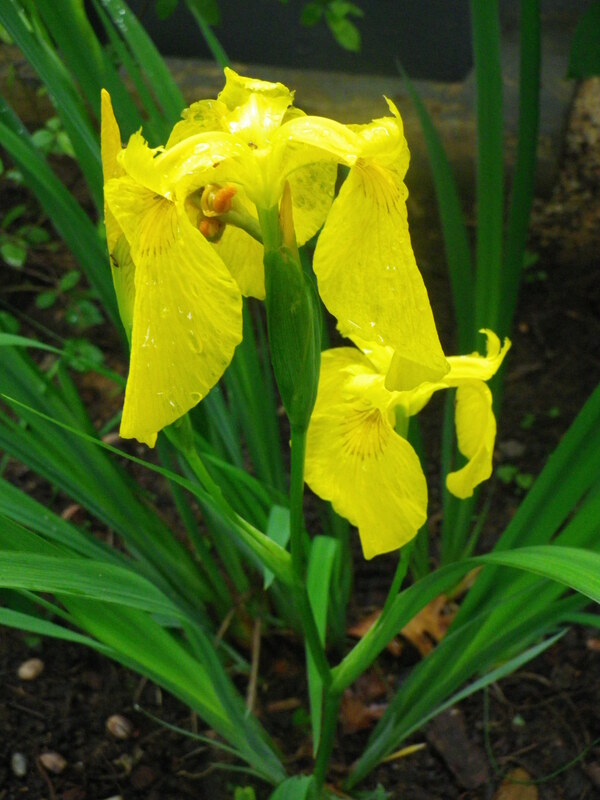 This yellow iris always confuses me – is it a Japanese iris? or Siberian? Either way, its cheddar yellow color is a little hard to use. It shrieks next to pale blues. The coral bells are still going strong, and the azalea behind them is beginning to fade. ‘Zepherine Drouhin’ was glorious this spring, with pale blue pansies and a few allium triquetrum alongside. Today there are drifts of petals on the ground. The tradescantias have a life of their own. I know I planted at least one in front and another one or two around the oak tree, all probably from Mom. Now they show up everywhere in various shades of blue. The one on the left popped up by the fence in the corner under the crepe myrtle. Next to it is the slightly darker blue under the oak. 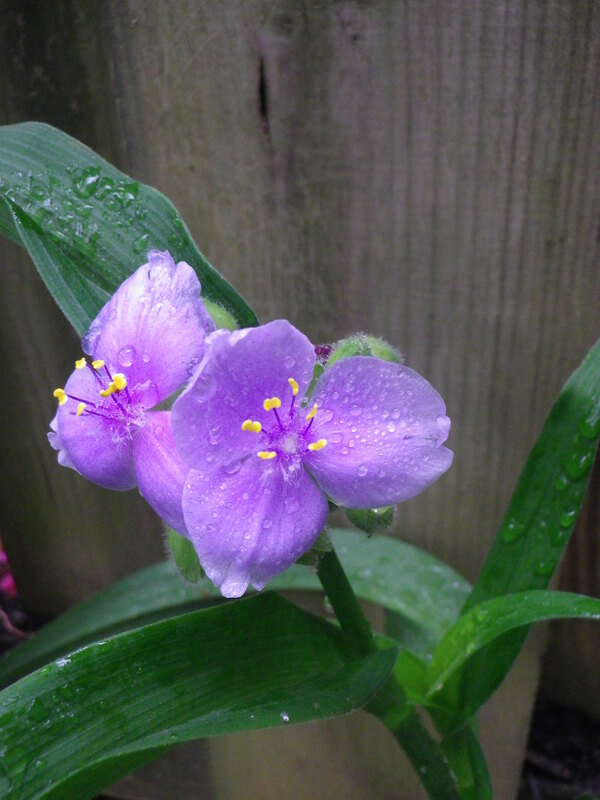 They are loving this cool, wet spring.